It's always wise to go into a room makeover with a clear budget in mind. 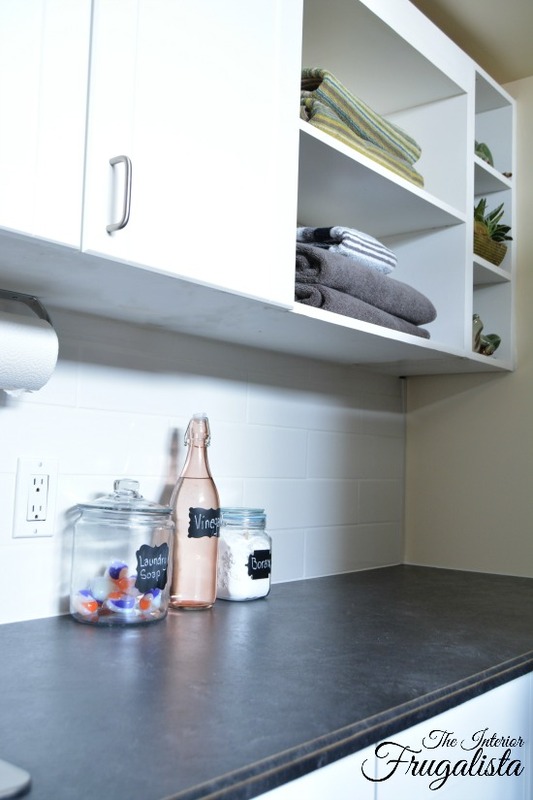 But as we quickly learned, hyper-focusing on getting the biggest bang for your buck to meet that budget without an equal focus on the function of the space will more than likely lead to a second makeover. 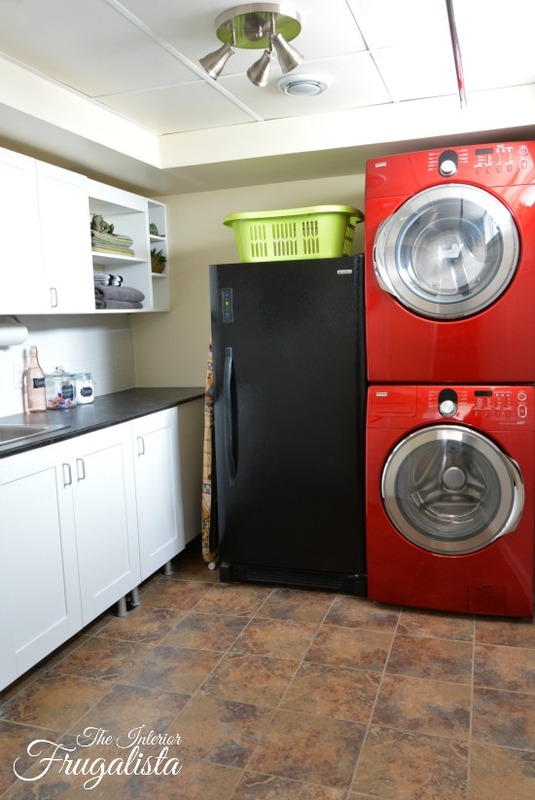 So it comes as no surprise that this post is about our Basement Laundry Room Makeover Two - 4 problems with the original design. 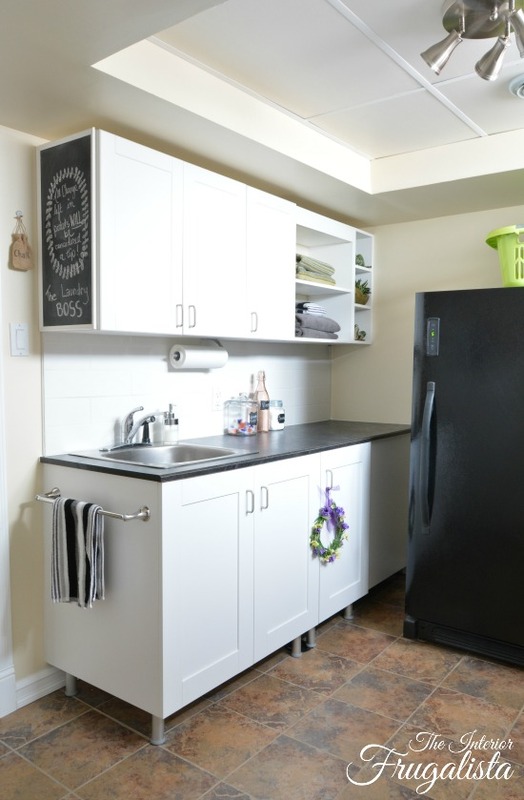 We loved our original Basement Laundry Room Makeover On A $500 Budget and were so proud of the transformation on such a tight budget BUT it didn't take long for us to realize there were some major flaws with our design. Can you pick out the function problems in the photo below? A HUGE improvement wouldn't you say? But now take a look at the room AFTER we improved the function. Big difference, right? 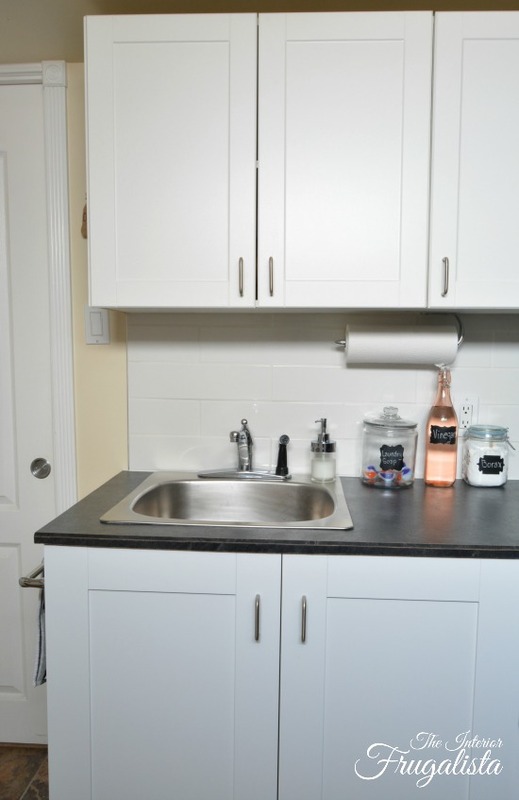 We were able to salvage most of the original makeover elements but just by moving the appliances and cabinets, it completely opened up this space. 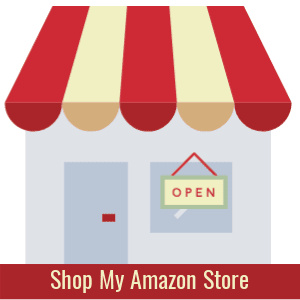 Disclosure: I've included affiliate links in this post so you can find the products I used or recommend for this project. See my disclosure policy. 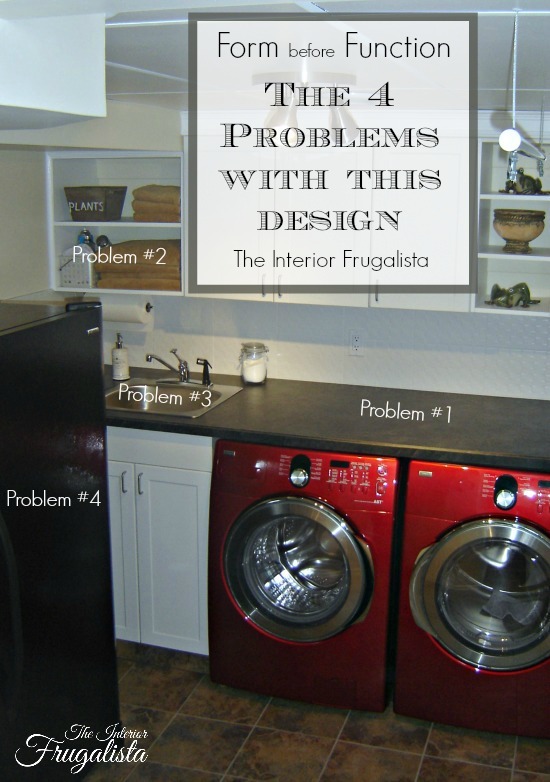 Let's take a closer look at the four problems with the original laundry room makeover design. 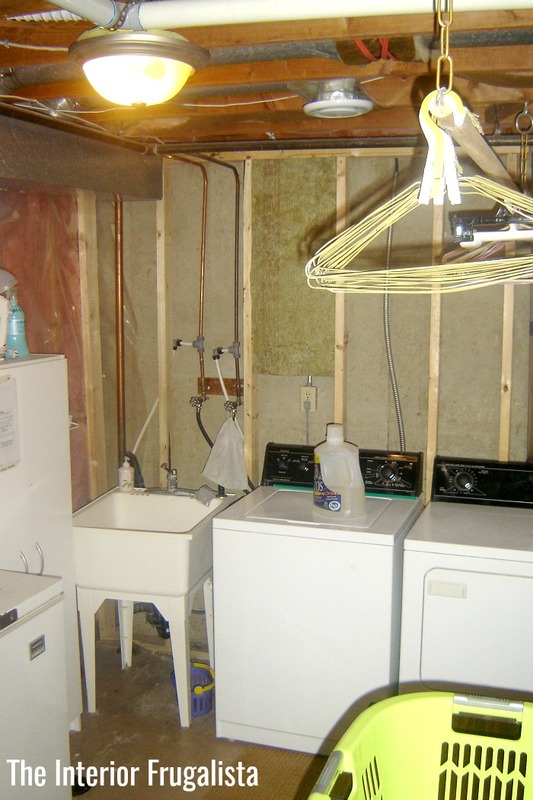 After getting our new appliances, the obvious choice at the time was to build a countertop over the front loading washer and dryer. I was so happy to finally be getting a spot to fold laundry, I never gave any thought to how a 36-inch depth would make it near impossible to reach the electrical plug on the backsplash for plugging in the iron. Because of the counter depth, reaching anything towards the back of the upper cabinets was impossible without a step ladder. I felt like I was stuck in the corner for a timeout when using the laundry room sink. Aside from laundry, I also use this sink to clean paintbrushes when doing furniture makeovers in the adjacent workshop. I had to walk the length of the room holding dripping brushes to access the sink. At 28-inches deep, our upright freezer stuck halfway into the room, making the space feel tight and awkward. To the left of the freezer is a pocket door leading to the hallway and the freezer wasn't the nicest sightline from the media room down the hall. But the biggest annoyance was to access the sink you had to walk around the freezer. 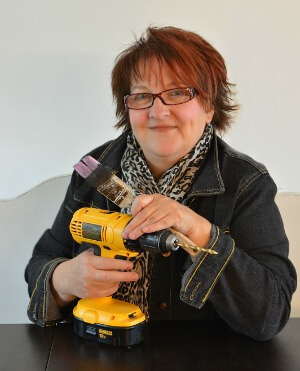 While in the planning stages of reconfiguring the room, I received an email from Michele at The Redesign Habit telling me about an e-book she recently published called The Redesign Toolkit: A DIY Guide To Budget Friendly Interior Design. She couldn't have timed that email better. In the book, she includes a helpful room evaluation worksheet and so I filled it out. What things do you not like about the room? I answered that question above in problems 1-4. What are the storage needs for this room? How do you want your space to feel when it's finished? 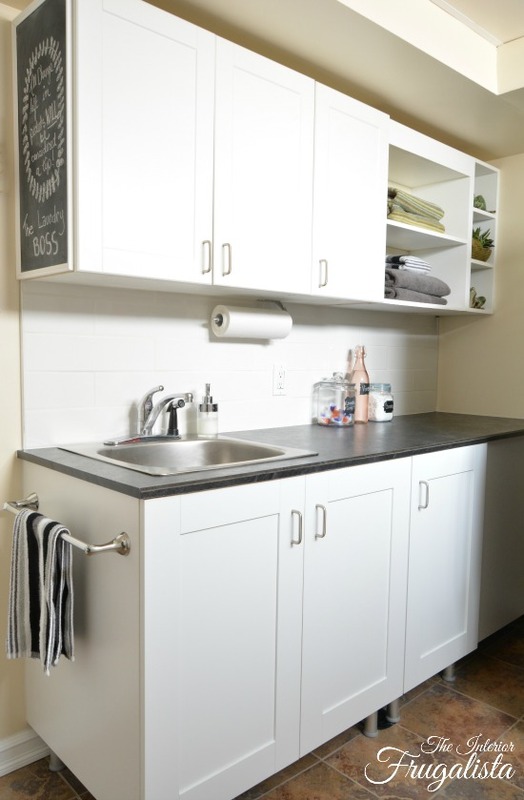 Those four questions helped me determine the lack of functionality of this space, what elements to keep, and how to reconfigure those elements. Michele also offers a The Redesign Toolkit which includes a scaled floor plan guide and furniture cutouts to help figure out the best placement before breaking your back doing the real thing. 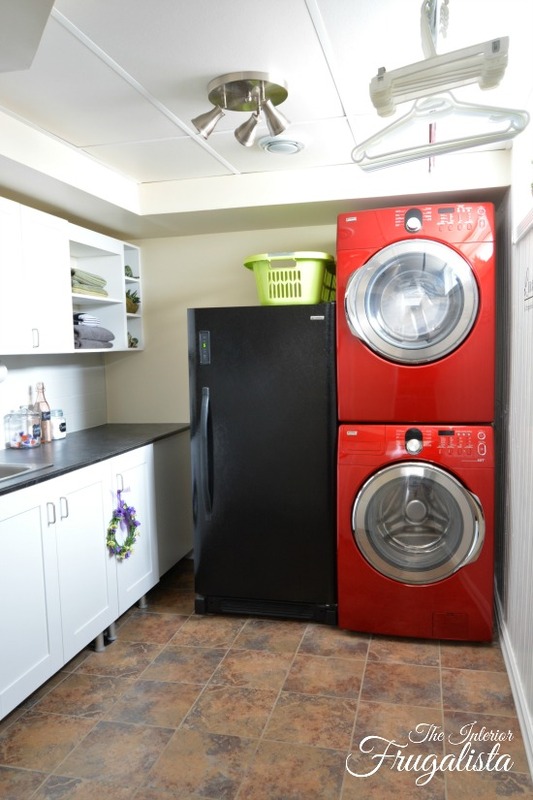 By purchasing the stacking kit for our front loading washer and dryer, we were able to make room for the upright freezer beside them. This change alone remarkably improved the spaciousness of the room, traffic flow, and work triangle. By moving the appliances against the back wall, it opened up the other wall for a bank of lower cabinets. Home Depot was clearing them out and happened to have the same door profile as our existing upper cabinets, purchased elsewhere. I love the open industrial feet which add to the spacious feel of the room. The upper cabinets and open shelving were salvaged to fit above the new bank of lower cabinets by modifying the depth and width. Thankfully we were able to reuse the old countertop by decreasing the 36-inch depth to 24-inches and decreasing the length to fit the new lower cabinets. To do this we used a straight edge jig clamped onto the counter and cut it with a skill saw. We found black melamine pre-glued veneer edging that matched the existing veneer and applied it to the exposed edge. The sink is now located next to the sliding pocket door leading to the hallway. No more walking through the entire laundry room with dirty paint brushes. We also added a much-needed towel rack onto the end of the lower cabinets. Unfortunately, we were unable to salvage the old Twill White Field backsplash tiles, which I loved. 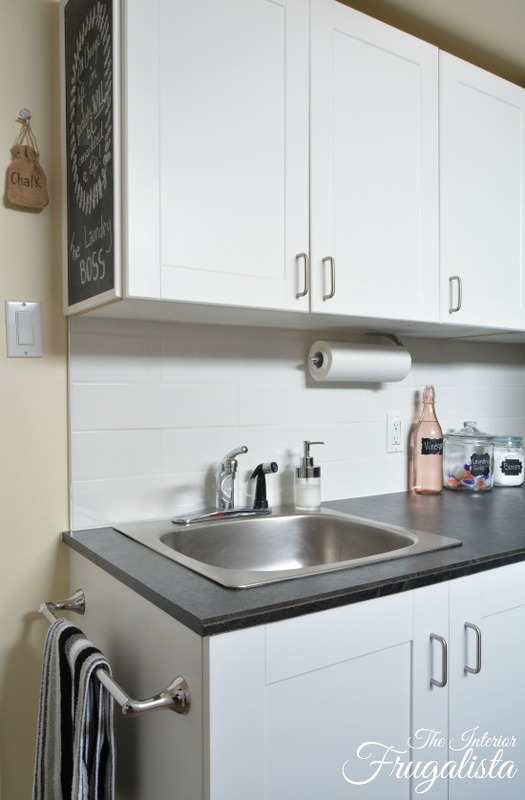 We found these 4" x 16" white subway tiles for a good price and I like the simple clean look. 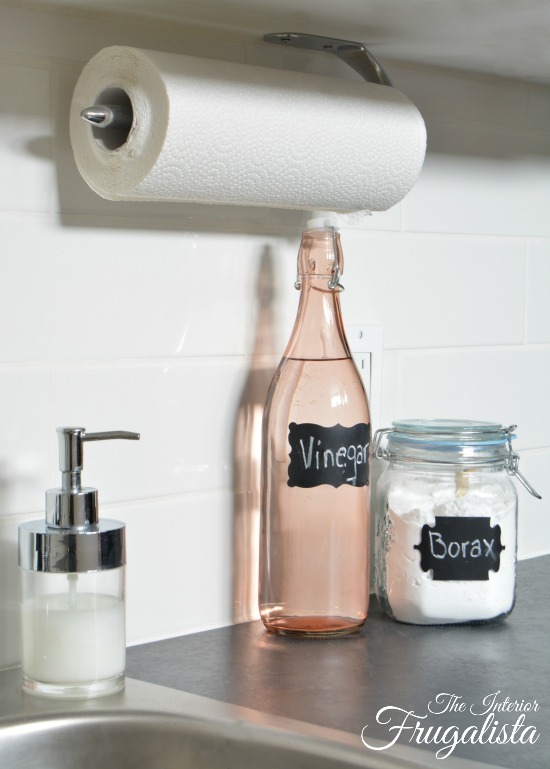 At the end of the upper cabinets, we added a chalkboard for funny messages or shopping lists. I painted the end of the cabinet with black chalkboard paint and framed it with wood trim painted the same color as the cabinets. 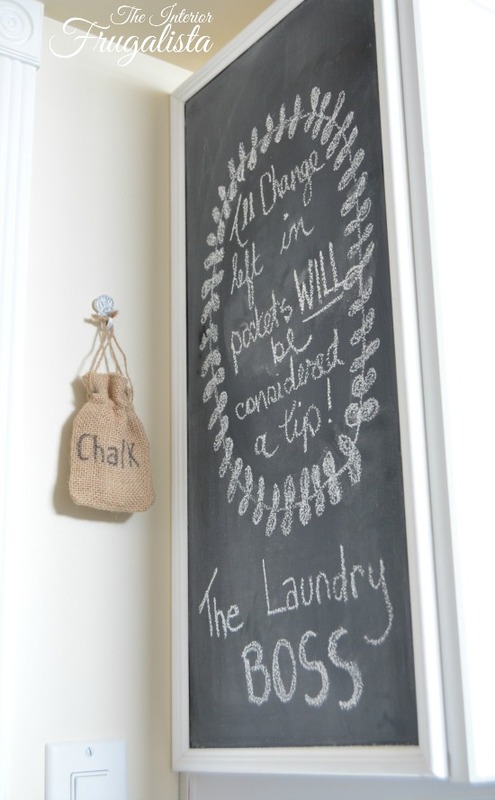 I had a burlap pouch in my stash and wrote CHALK with a Sharpie marker and hung from a small hook to store extra sticks of chalk. 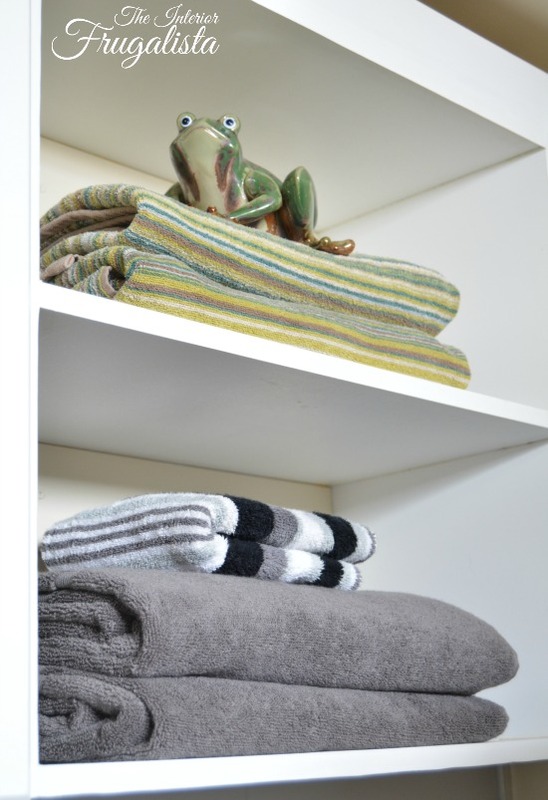 The open shelving is perfect for storing extra folded towels for the adjacent bathroom. 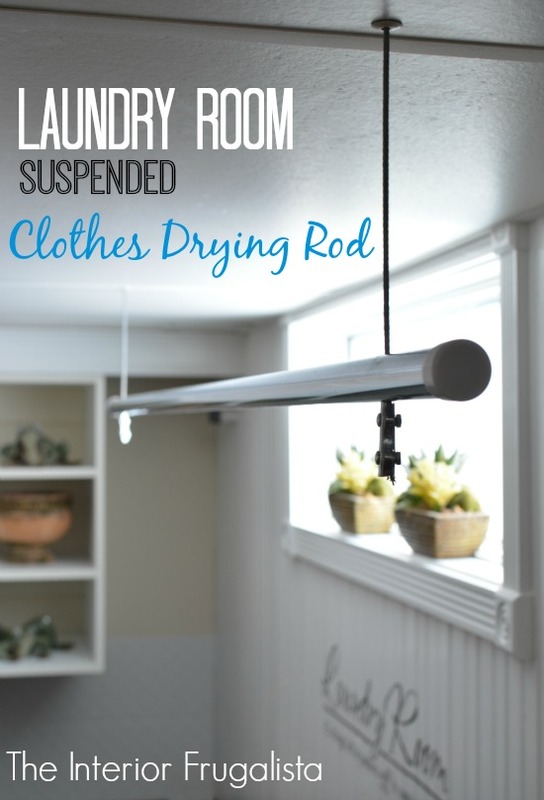 We were able to keep our DIY Suspended Clothes Drying Rod on the window wall pictured below. 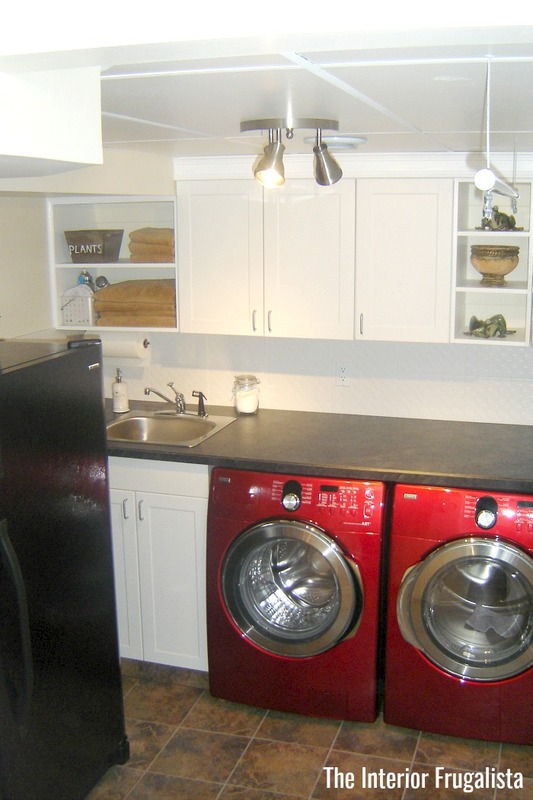 While it was unfortunate that we hadn't considered function over form when doing the original basement laundry room makeover, I am so glad we were able to salvage most everything from the original design. 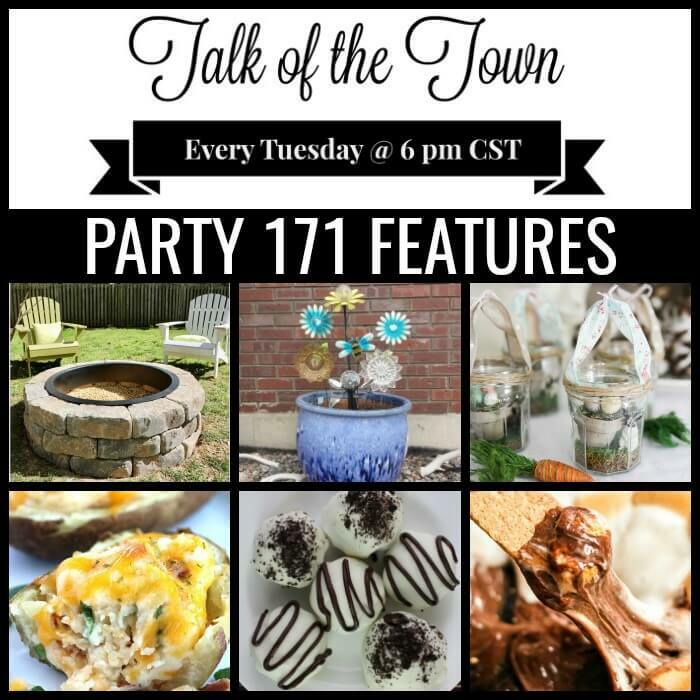 These changes added less than $100 to the cost of the original $500 room makeover.